Let's meet our Award winners! On the first day of our Annual meeting, we organized a session 'Poster Pitches'. Every presenter had one minute to pitch their poster to engage the audience. Based on the assessment of a handpicked expert jury, the best poster and presentation prizes were awarded. 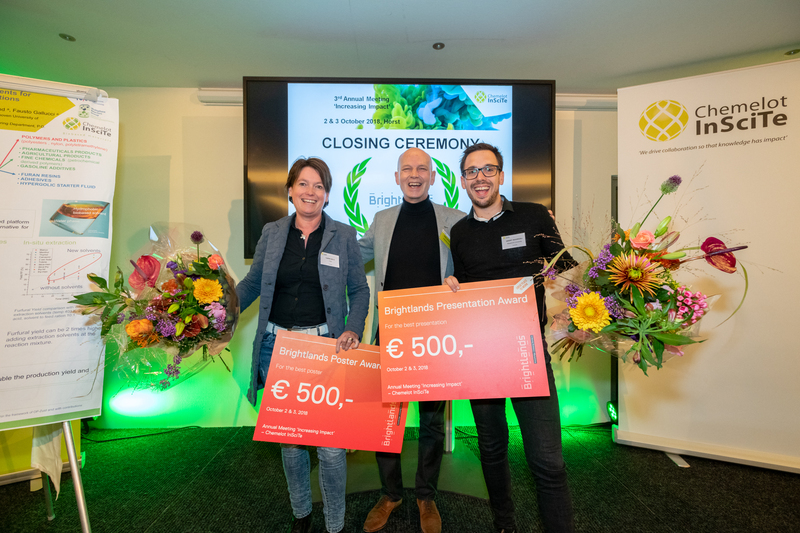 Brightlands generously sponsored these Poster and Presentation Awards, which were handed out by our Managing Director Emiel Staring, in the closing award ceremony on Wednesday. Carin Dietz won with her poster 'Development of new extraction solvents for furfural isolation from aqueous solutions’. Geert Noordzij won with his presentation '‘Small-scale screening of novel biobased monomers: The curious case of 1,3-cyclopentanediol’. Who is the Poster Award winner this year? I’m Carin Dietz PhD student in the group inorganic membranes and membrane reactors at the University of Technology in Eindhoven and I hope to graduate in June 2019. And Geert Noorzij the Presentation Award winner, let's meet him. As on organic chemist by training, but also with a strong passion for the environment and sustainability, I found myself drawn to combine the two in my work and research. Now, as a polymer chemist in the last year of my PhD, I’m working on the development of assessing, and making new polymers, based on renewable resources. After completion of my PhD I strive to obtain valuable research know-how in both academia as industry, to help realize the transformation towards sustainable solutions, products, and processes for our society and for our environment. Carin, how are you involved in InSciTe? I work in the Horizontal project is in the biobased part of InSciTe. Geert, you won the best Presentation Award, what is your secret? Good question! I enjoy communicating about science, and my research project a lot. Plus I like to trigger people and make them think by doing things slightly different, maybe that combination works well in this environment? Carin, you won the best Poster Award even though there was a mixed up and the wrong poster was visible during your pitch. Did you expect this? No off course I didn’t expect this. I thought Geert Noordzij would win the poster- prize because his pitch was really great! But when we wanted to get our posters my poster was gone and then it was clear to us that I won the poster prize. Geert, any plans with the prize money? Yes I have a special plan, beginning start capital for my defense party..
What does InSciTe as an institute means to you Carin? InSciTe gives me the opportunity to do my PhD in a great group of people. Not only thinking about your own work but see it as a bigger picture. Trying to reach the goal with everyone. Geert, InSciTe organized this year the 3rd Annual Meeting, how did you experienced the event this year? As every year it’s a joy to be there, great to see how the projects all develop, and of course great for networking and socializing. Furthermore, InSciTe as an institute reminds me much of how DPI used to work. A great platform to bring researchers form different disciplines, universities, and companies together. I think these joint efforts have a big chance of contributing to new findings for the worlds challenges in research, so I hope it can keep on going for a long time. Geert: Hopefully see you next year, and don’t forget to bring the party lights!